Those who are bitten by the affordable yet high-end, Japanese watch collecting bug will absolutely go head over heels with the Orient Automatic Power Reserve FDAG002B Men’s Watch. Vastly different from the usual norms that shape a formal watch, this model catches the eye because of its numerous sports-inspired elements that are hard to find in any other watch within the price range. While Orient is famous for their unique and quirky products, the brand tends to surprise us with enchanting designs from time to time. The Orient Automatic Power Reserve FDAG002B Men’s Watch is one such simple and elegant model that comes with a true vintage undertone, giving a hard competition to models even above the price range. The Orient Automatic Power Reserve FDAG002B Men’s Watch lets you immediately realize that your money is well-spent. As far as the design goes, it gives out more than just a basic vibe; it’s more of a dark, royal theme the Orient Automatic Power Reserve FDAG002B Men’s Watch bases upon. The Orient signature power-reserve indicator comes as an added, useful feature while the 41mm (excluding crown) case size is just right for most of the wrists. Its dressy, thin case profile makes it the perfect tool for both the workdays and weekends. It is going to be delusional to claim the workmanship and quality of the Orient Automatic Power Reserve FDAG002B Men’s Watch compare to Swiss megabrands; at the most, you’ll feel the quality is same as that of entry-level, mechanical Swiss watches. The tonneau-shaped case and the bracelet have a prominent brushed finish on the black PVD-coating, the fine micro-grooves visible due to their careful etching. The bracelet is not the tapered kind but straight, which gives the watch a more solid look. 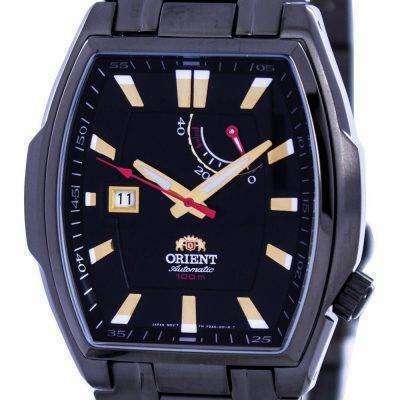 The Orient Mens Watches logo on the clasp is cleanly pressed and detailed as a fine work of art is supposed to be. The black dial with gold-toned and lume-tipped hands and hour markers provide a sharp contrast, resulting not just in an outstanding visibility but also adds a prestigious demeanor to its appearance. The power reserve indicator hand is highly visible when you want to see it; else, the dark red hue conceals it well against the black background of the dial. The beveled, polished and shining bezel stands out from the brushed case underneath, keeping monotony from setting in. Under the dial runs an ORIENT caliber 46N40 self-winding movement with 21 jewels and beating at 21,600/vph. Apart from indicating the power left in the mainspring, it also shows the date. The pictures don’t do justice for the Orient M-Force Automatic Men’s Watch; its premium presence noticeable only in real life. It is this quality that backs up the great looks of the Orient Automatic Men’s Watch and highly qualifies as an affordable watch that makes for an excellent daily office beater.